Notice an unfamiliar word? Gravid. It means pregnant. You learn something new every day, huh? 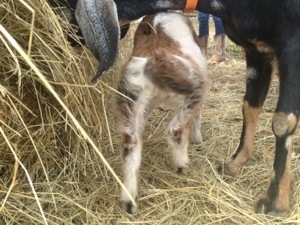 Well, let me tell you… While gravid isn’t a “goat word” in the “goat world” I am CONSTANTLY learning (and failing! Ha!). Since we began this adventure Justin, my dad, my 4 year old nephew, and I have learned about (almost) every breed of goat you can imagine. 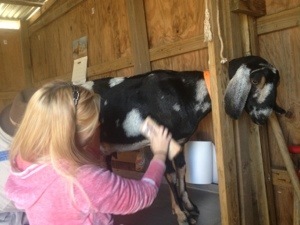 We also have begun to notice every other goat owner we see driving to and from AL. It is quite embarrassing to ride with us because we will then commence with what breeds these different owners have and begin to recite everything we have learned about them. We are officially goat nerds. Remember how I said over and over at the beginning that this was MY endeavor and I was going to do everything by myself. Ha. My husband soon became just as addicted. Hook, line, and sinker. I love it! 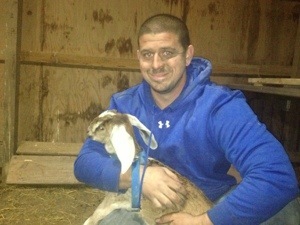 He and dad, after researching breeds, decided on a dairy goat breed they really really wanted. La Mancha’s. These goats are easily identifiable because they look as if they have no ears! Funny, huh? Well, dad talked to a guy, who knew a guy, who’s brother was a good friend of dad’s… Who had La Mancha’s! So, on Dec 29th off dad and I went! How could you not take them home? Oh, they were mine instantly. Ahhh, sweet love. And better yet… They are pregnant! Due in feb! Babies!!! 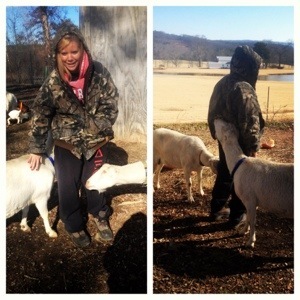 So, we loaded these two gorgeous ladies up… But guess who decided he wanted another goat also, Dad. Random side note: Remember I told you dad bought two HUGE African geese? So huge they couldn’t fly? Two days later… They flew away! Hahahahahahahaha! Sorry dad, I’m still laughing about it a month later! Now, back to my story. 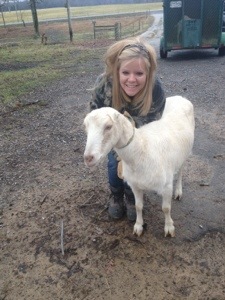 Dad bought a beautiful spotted Nubian and her gorgeous baby. I am so glad he did! She still had milk and we have been experimenting with goat cheese so we know what to do before we are up to our EARS in milk come feb. Remember, Greta is due then AND the two La Mancha’s. Are you ready to meet the gorgeous ladies? Meet Gretchen the gravid La Mancha. Meet Giselle the gravid La Mancha aka “the bearded lady”. And last but not least…. Drum roll please…. Georgia the milk goat Nubian and her baby Genie the Houdini Nubian! Genie, when we got her, was only about a month old and had not been handled much. Due to this she was quite skittish. She was honestly like a little Houdini! Catching her to hold her (so we could get her use to us)was almost impossible! However, she is much better now! 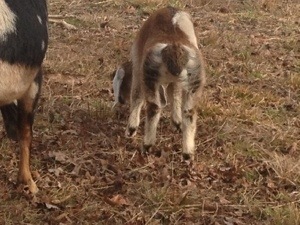 She also, has the cutest hind legs. The fur is crazy and it almost looks like she’s wearing pants! So funny. Love these new ladies! And Giselle, aka “the bearded lady”, quickly became the new queen. 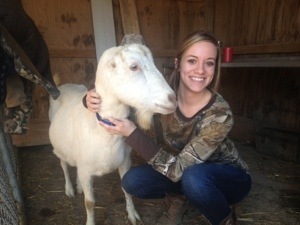 She is huge, forget Gertrude’s horns, Giselle is a monster! But a sweet one :). 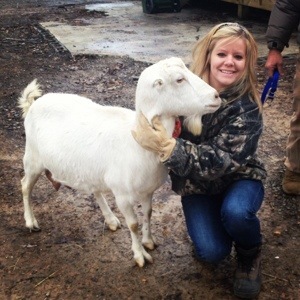 However, I think Gertrude would use a much different word to describe the new herd Queen. Ha. Hope you have enjoyed the post! I’ll leave you with a few goat facts! 1. Goat meat is called Chevon or Cabrito. It is lower in cholesterol and fat than beef, pork, and chicken. 2. A group of goats can be called a herd, trip, or tribe. 3. Supposedly, goats are good swimmers. I want to see that! 4. 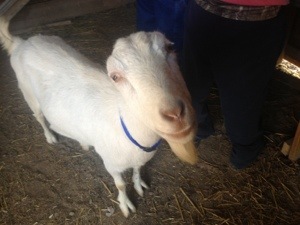 Goats do not eat tin cans. They are actually pretty picky eaters. Although, they did eat my calendar 🙁 not the whole thing but enough that I had to throw it away. 5. Mohair comes from the angora goat and cashmere from the cashmere goat!